“This weekend, when the next cargo resupply mission to the International Space Station lifts off from NASA Wallops Flight Facility in Virginia, it will be carrying among its supplies and experiments three cereal box-sized satellites that will be used to test and demonstrate the next generation of Earth-observing technology. NASA’s Earth System Science Pathfinder program selected Steven Reising of Colorado State University and partners at JPL to develop, build, and demonstrate a five-frequency radiometer based on newly available low-noise amplifier technologies developed with support from ESTO. 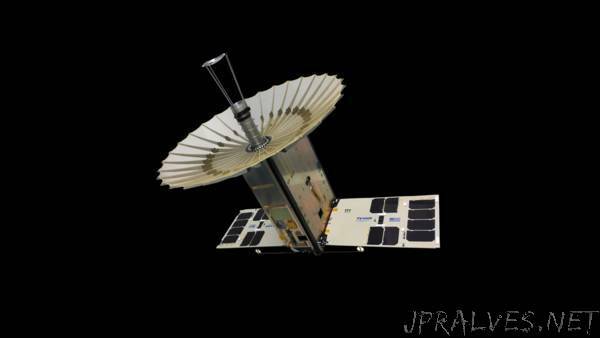 The TEMPEST-D (Temporal Experiment for Storms and Tropical Systems Demonstration) mission will validate the miniaturized radiometer technology and demonstrate the spacecraft’s ability to perform drag maneuvers to control TEMPEST-D’s low-Earth altitude and its position in orbit. The instrument fits into a Blue Canyon Technologies 6U CubeSat — the same size CubeSat as RainCube and CubeRRT.